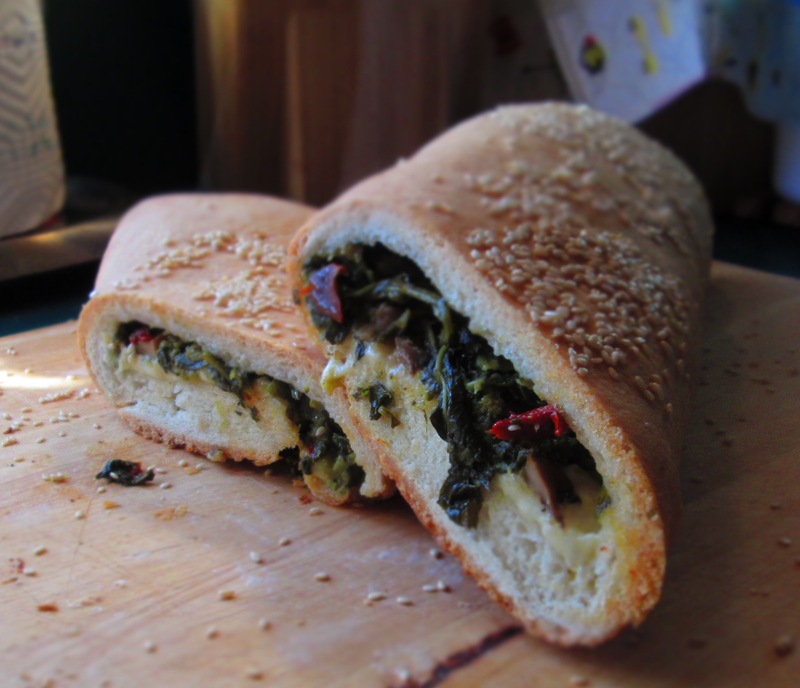 What happens when you have the urge to bake bread and have some broccoli rabe in the refrigerator? 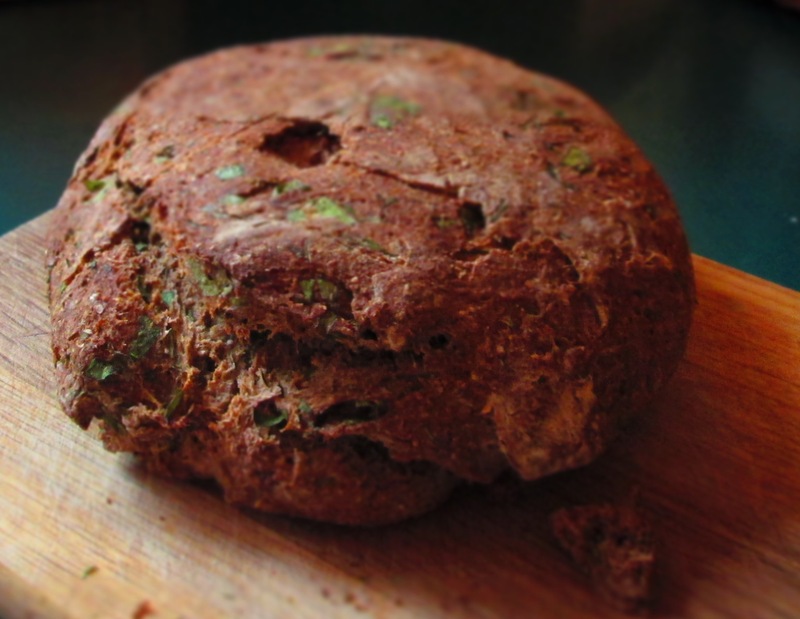 You make broccoli rabe bread, of course. 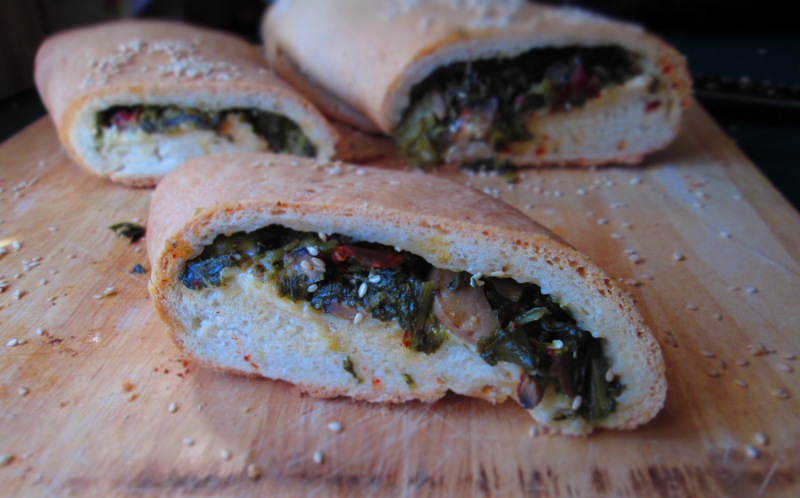 Or, more specifically, broccoli rabe and cheese-stuffed bread. 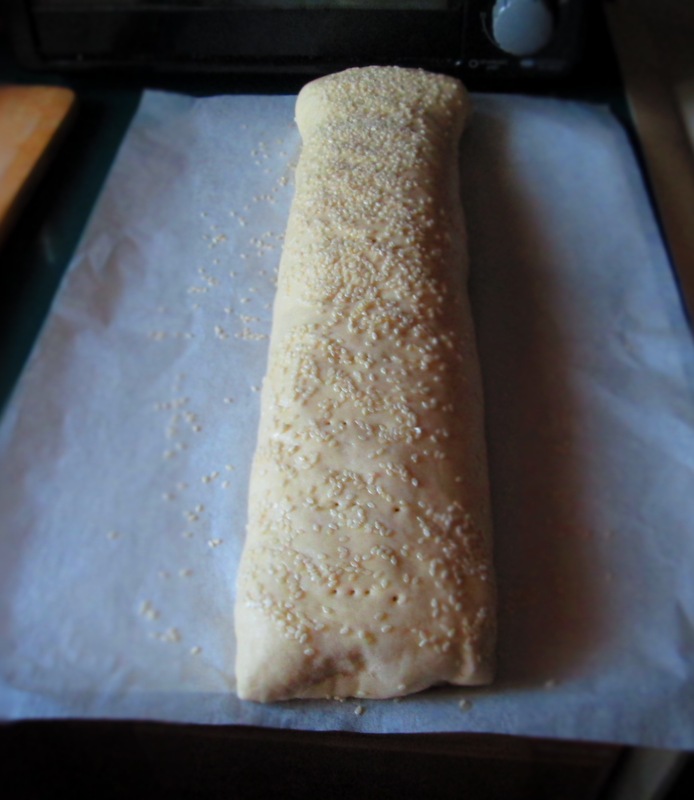 Stuffed bread is an age-old delicacy and Italian cuisine is known for many kinds. In this one, the pleasant bitterness of the broccoli rabe is tamed by the rustic bread. The addition of cheese lends a salty sharpness to it. You can use whatever cheese you want. I used a blend of Fontina and Jarlsberg. If you like, you can add a sprinkle of parmesan cheese as well. I just bought a big ol’ package of yeast, so I think I’m going to be on a bread-baking kick for a while. We’ll see. In the meantime, try this one out for breakfast, lunch, or a snack. By the way, it goes great with wine. 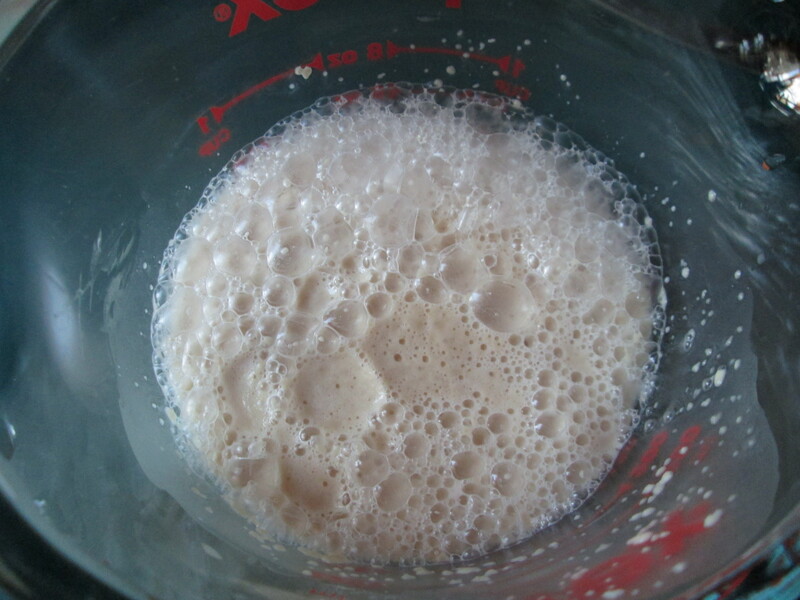 Combine the yeast with sugar and ¼ cup very warm water. Stir until dissolved and let sit for 5 minutes until it bubbles and foams. 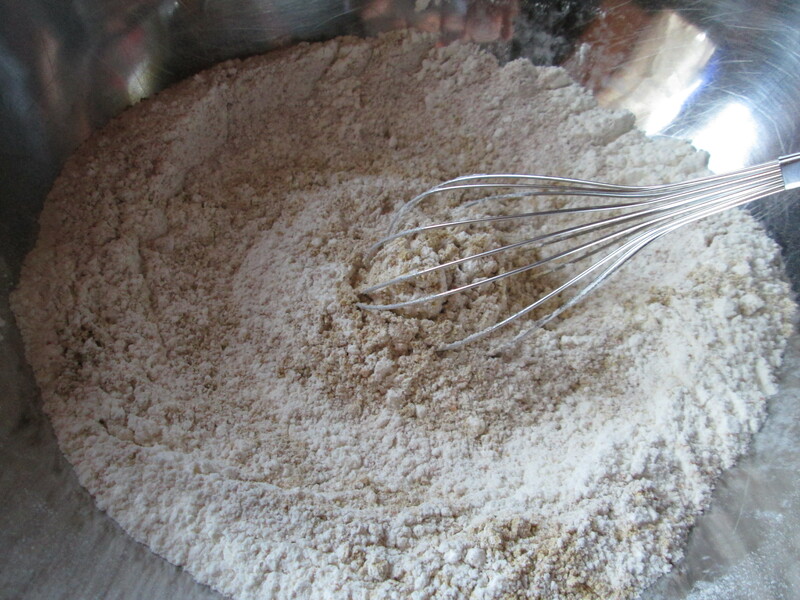 Combine 2½ cups flour and salt in the bowl of a stand mixer with the dough hook attached. Add the yeast and butter and begin mixing on medium speed. Begin adding milk a little at a time, then increase speed until dough comes together. Continue mixing for a couple of minutes. 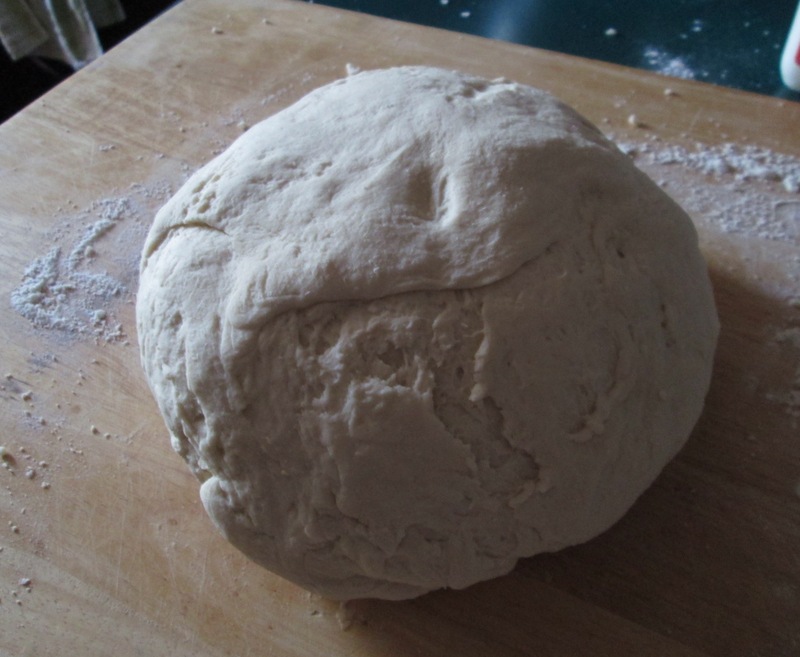 Transfer dough to a lightly floured board and knead for 2 or 3 minutes. 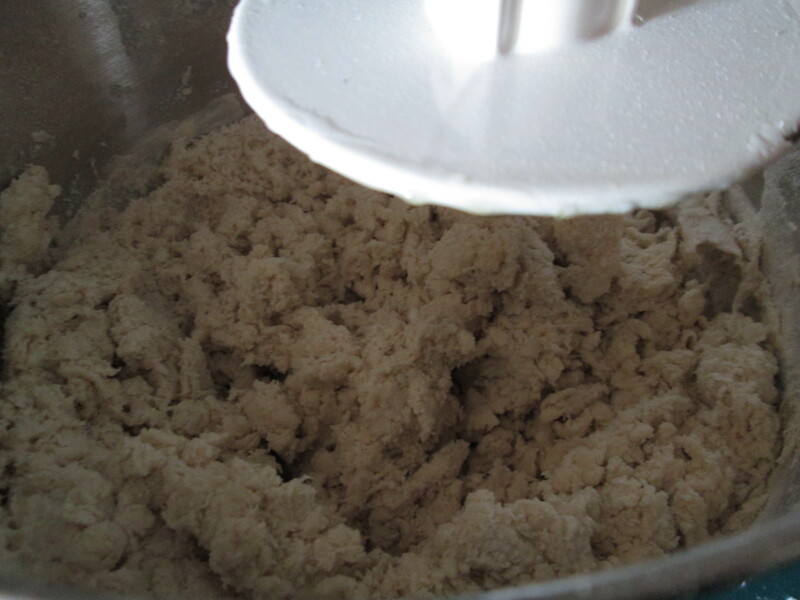 Place oil in bottom of mixer bowl; place dough in oil then turn it over so that all of dough is coated. Cover with a clean towel and place in a warm, draft-free place and let rise for 1 hour. Meanwhile, make filling. Heat oil in a wide pan. Add garlic and saute for 1 minute. Add mushrooms and ½ teaspoon salt and sauté until they start to brown, about 10 minutes. Add broccoli rabe, red pepper flakes, and remaining salt; cover and let cook until tender, about 5 minutes. If pan dries out, add a little water, white wine, or broth. 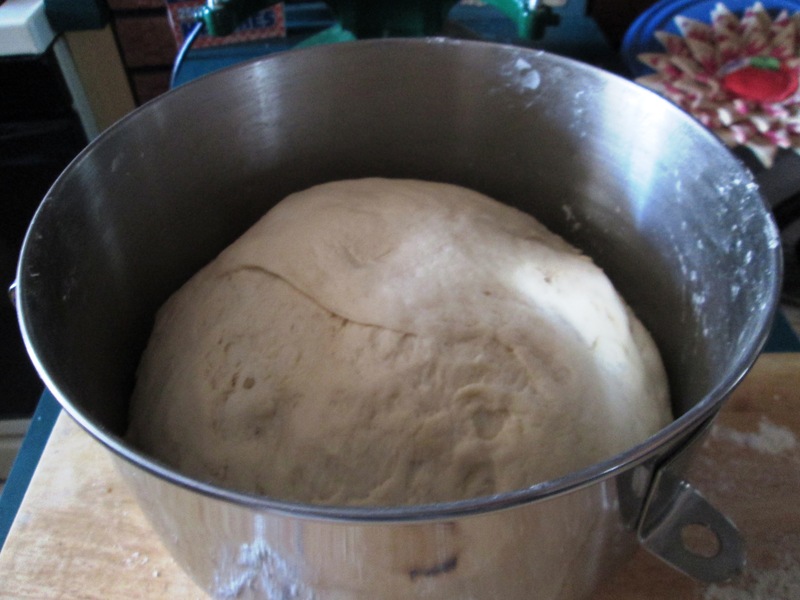 When dough has risen for an hour, place on lightly floured board again. Roll out into a rectangle about 8 x 15 inches. (It doesn’t have to be perfect, as my picture can attest.) Place the broccoli rabe along the center of the dough, then spread on the cheese. 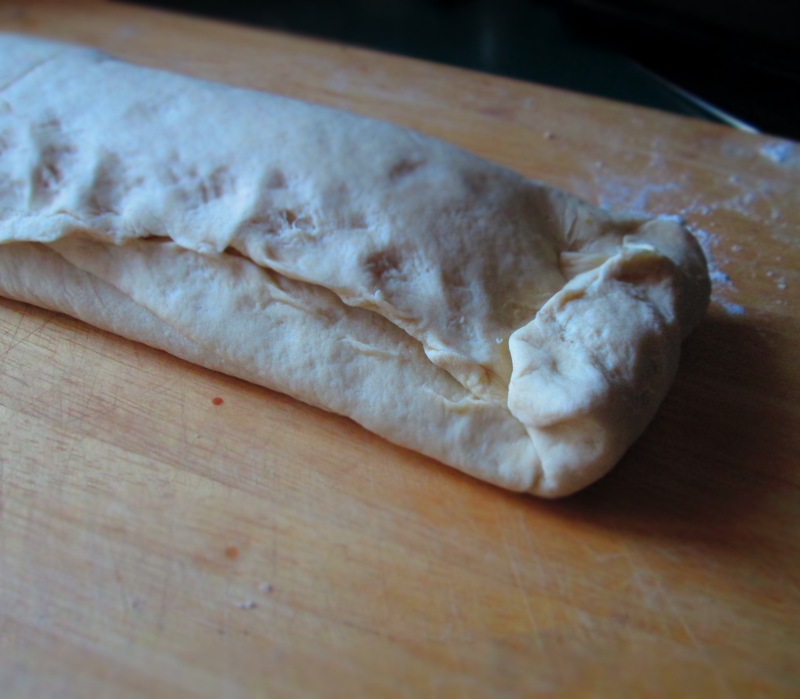 Roll up dough and pinch the seam together. Tuck in the ends and pinch together. Place on a baking sheet lined with parchment paper. Cover with the cloth and let rise again for another hour. 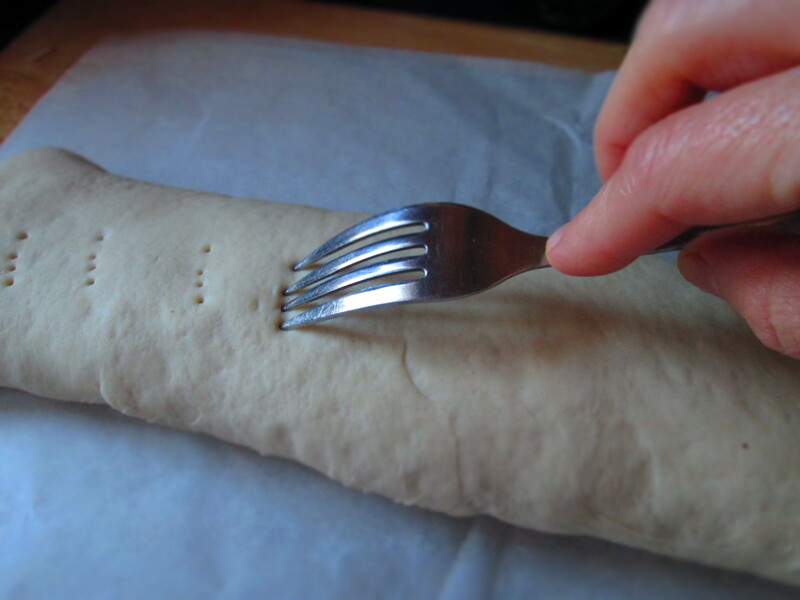 Prick the dough with a fork in several places. 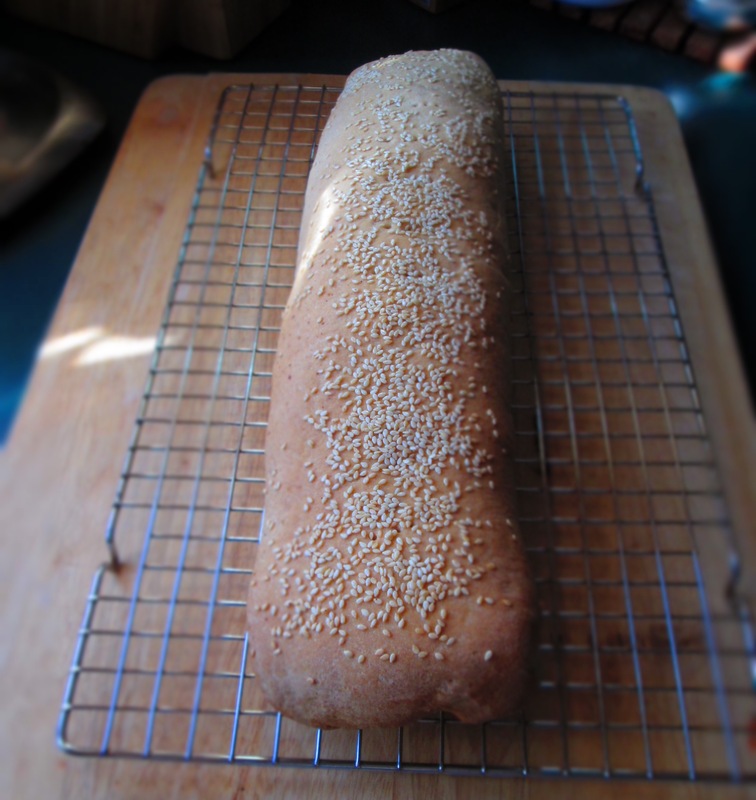 If you want to add sesame seeds, brush the top with egg and sprinkle on the sesame seeds. Bake for about an hour, or until golden brown and bottom sounds hollow when thumped. Move to a cooling rack and let sit for 5 minutes before cutting into it. 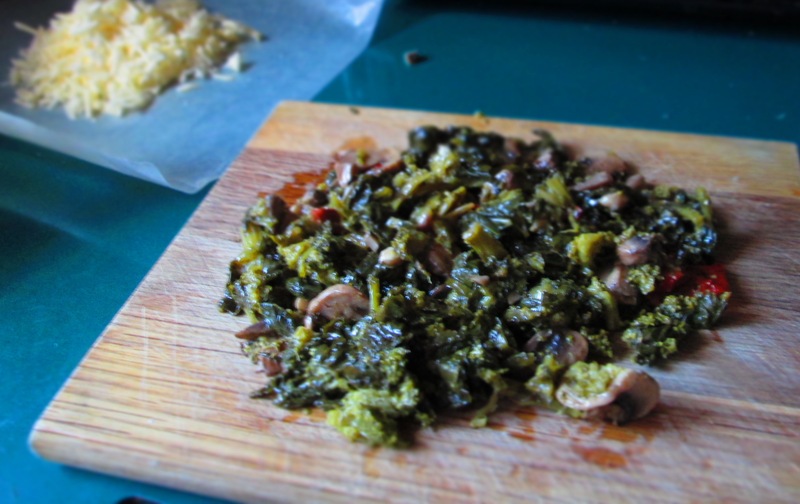 Categories: Baking, Bread, Experiments, Healthy eating, Recipes, Uncategorized, Vegetables, Vegetarian | Tags: bread, broccoli rabe, stuffed | Permalink. Over the past few years, I’ve experimented with quite a few gluten-free flours and I thought I’d seen, or at least heard about, most of them. 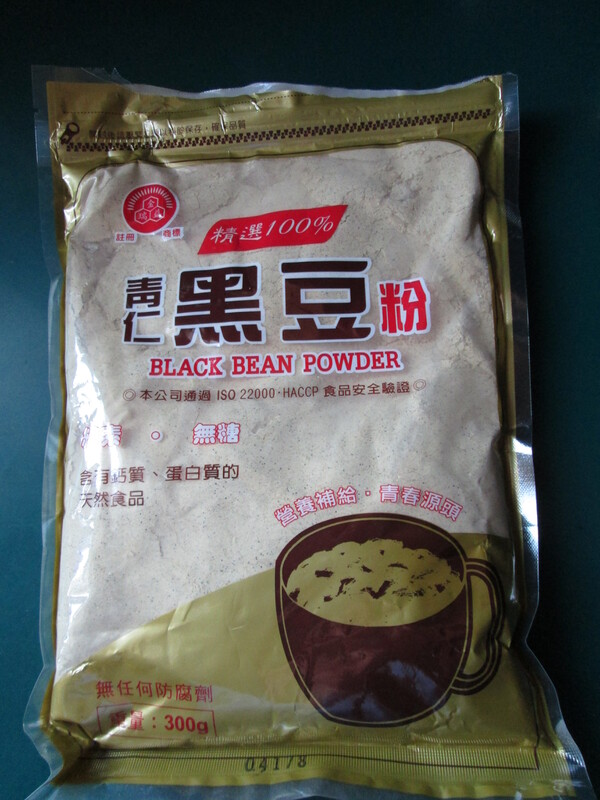 Then, recently, I found a new one: black bean flour (or powder). The reason I hadn’t seen it before? It was in the coffee and tea aisle in an Asian market. See, the coffee and tea aisle in an Asian market is not like the coffee and tea aisle in other markets. In an Asian market, next to the Folger’s and Maxwell House and Lipton and Celestial Seasonings, you’ll find an enormous assortment of beverage mixes to which you would add hot water. The teas, of course, include herbal “health” teas, but next to the coffees, you’ll find beverages made of grains, roots, and beans. These are all drunk in various Asian countries for various health purposes. In the case of bean flours, they provide protein. Black bean flour lends a dark color to whatever you add it to, so it’s generally added to breads, chocolate cakes, or dark vegetable dishes, such as black bean quesadillas. I decided to try my hand at bread. It turned out very well, and I’m going to try incorporating it into a gluten-free loaf next time. 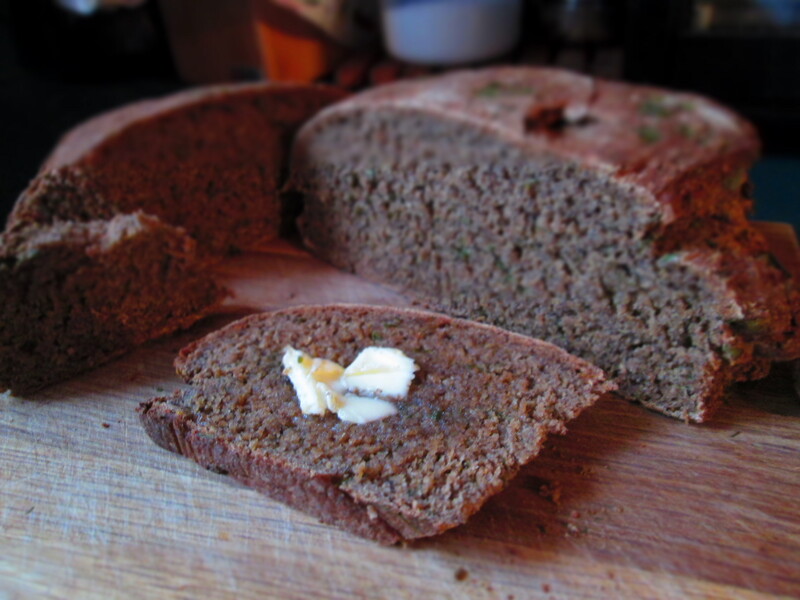 Black bean flour has an unusual flavor and takes a bit to get used to. But after I processed the first bite, I found the taste to be pleasant. I think it makes a great snacking bread with butter or jam to accompany coffee or tea. But I think it would also make a good hearty sandwich bread—any kind that you would make with a pumpernickel or dark European-style loaf. 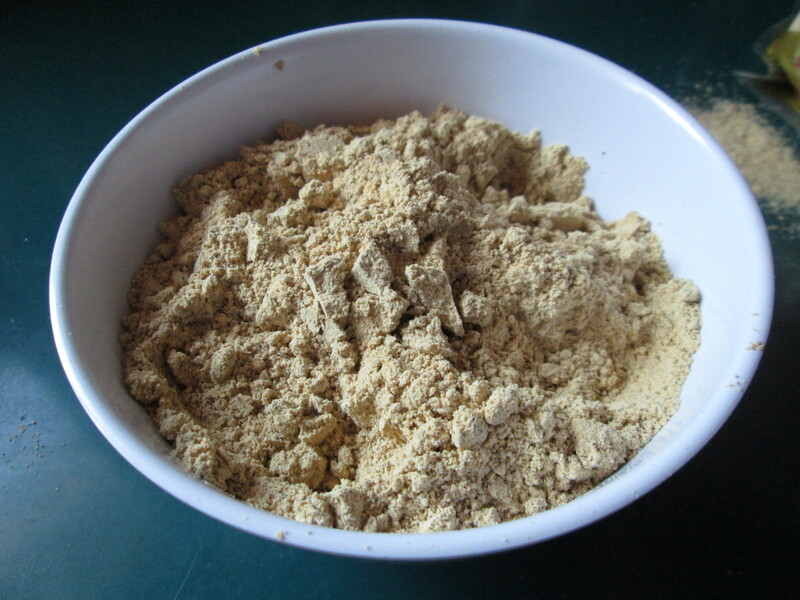 If you want to give it a try, look for black bean flour in an Asian market or Whole Foods. If you can’t find it, Bob’s Red Mill has it (they seem to only have one size, though—6.5 lbs.). 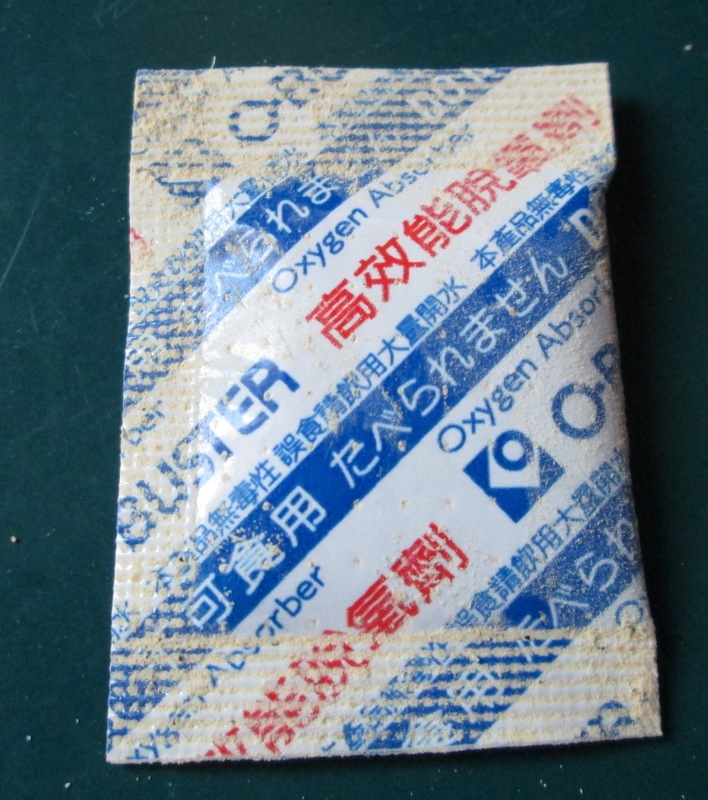 Oh, and be careful–I found one of those preservative packets in mine (oddly named “oxygen absorber”). 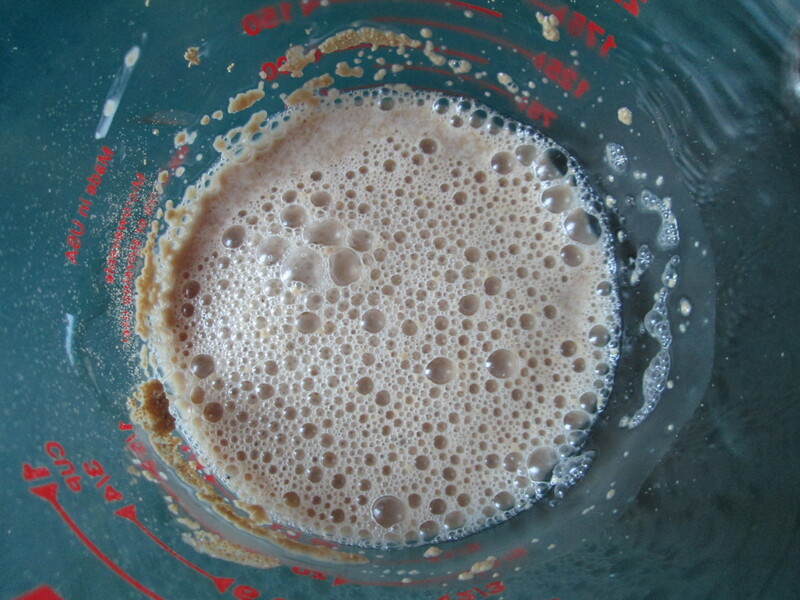 In a small bowl, stir yeast and sugar in ¼ very warm water until dissolved. Let sit 5 minutes until foamy. Pour in the yeast along with another cup of very warm water. Mix until all ingredients are well blended. Unlike most yeast breads, you don’t have to knead this. This will be a moist, somewhat sticky dough. Add a little more warm water if it seems dry. 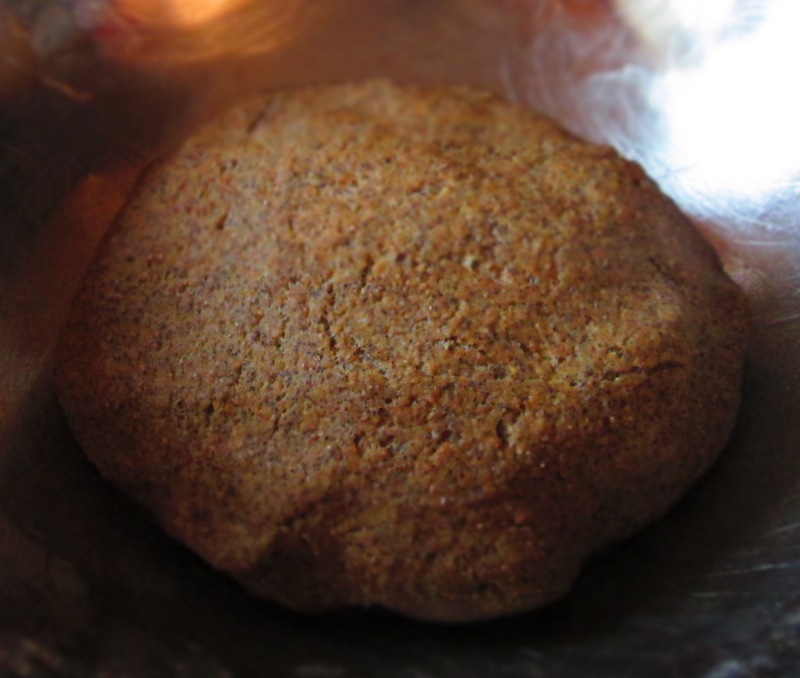 Coat the bottom of a large bowl with the oil; place dough in bowl and turn it over until completely coated with oil. Cover with a towel and set in a warm, draft-free place and let rise for 2 hours. Lightly dust a board with flour and turn the dough out. Flatten it a little. 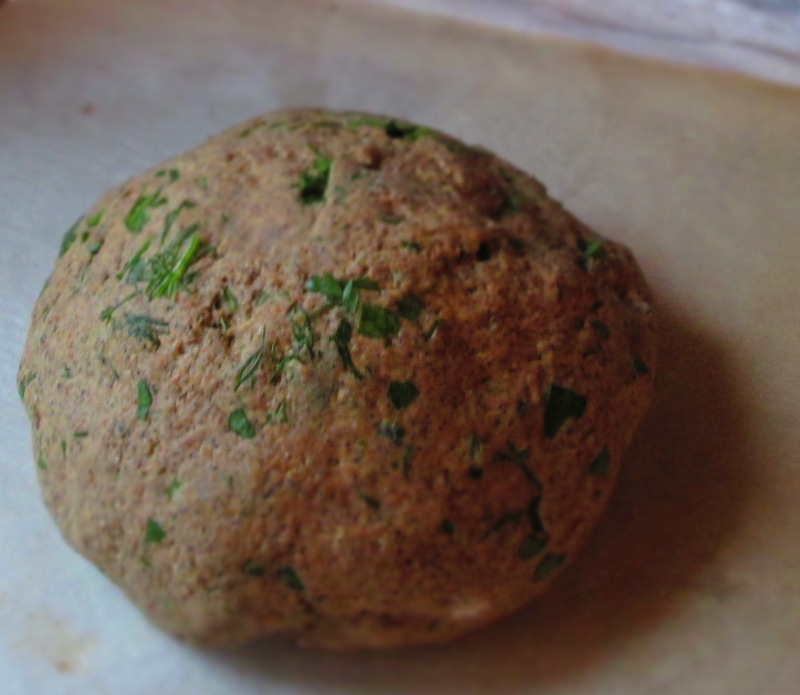 Add the chopped parsley and dill and begin folding it in. When herbs are well incorporated, stop working the dough. Preheat oven to 400 degree F. Bake bread until it sounds dense when you thump it, about 40 minutes for smaller loaves, 45-60 minutes for a larger loaf. 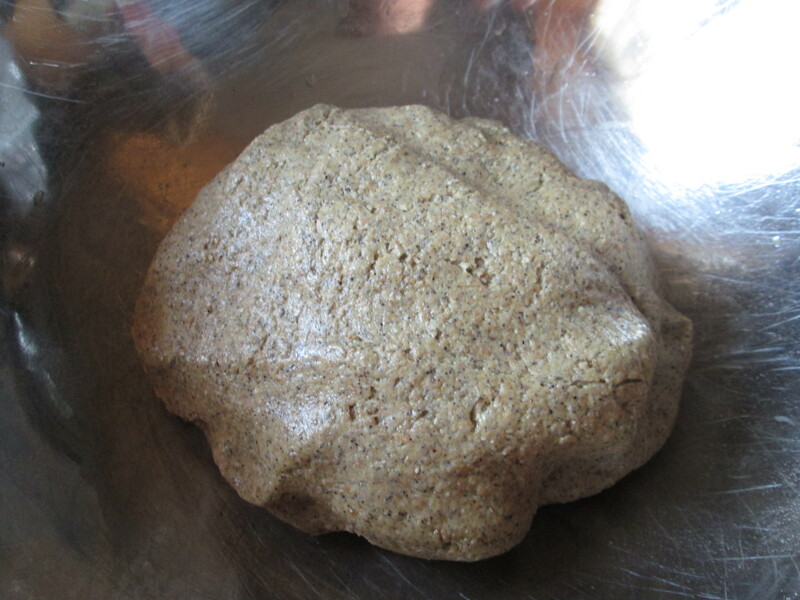 Categories: Baking, Bread, Experiments, Healthy Alternatives, New-to-me Food, Recipes, Uncategorized | Tags: black bean flour, bread | Permalink.